Terms & Conditions: Available to new residential customers who connect to any new month to month contract. $10 delivery fee applies. MyRepublic is all about maximising your online experience, that is why all of our plans are unlimited. Enter your address to find out what services are available to you. The first nbn™ powered plan for GAMERS. Order our Gamer Internet plan today to access our Traffic Prioritisation system and Global Custom Routing platform to give you the best gaming connectivity we can deliver. Read more about our Gamer Network, Custom Routing, Additional Features, Gamer Perks and Gamer Community support. 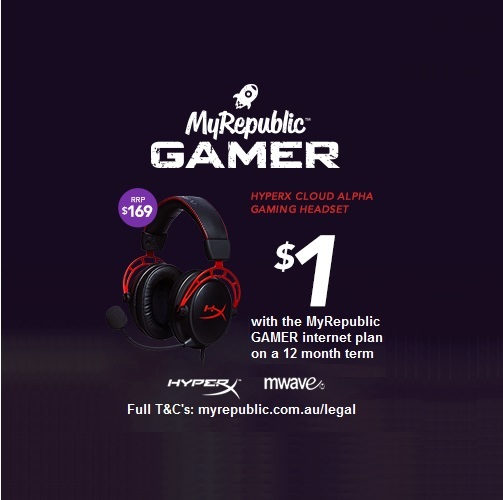 For a limited time, get the HyperX Cloud Alpha gaming headset for only $1 on a MyRepublic Gamer Internet plan on a 12-month contract term. Offer ends 30.06.2019. Promotional Terms & Conditions apply. Why wait? Join the network enhanced for gaming. Get Unlimited Super-Fast nbn™ Premium discounted to only $79.95 p/m for the first year! Order now to save $10 per month for the first 12 months. The Unlimited Premium Promo plan provides you unlimited super-fast data with typical evening speeds of 83Mbps, unlimited calls to Aussie landlines for $79.95 per month when you bring your own modem (BYO). Available to new MyRepublic customers in selected areas. Speeds may vary. *$79.95 is inclusive of a $10 promotional monthly discount; this discount shall be valid for the first 12 months only. We reserve the right to cancel the promotion(s) without prior notice. 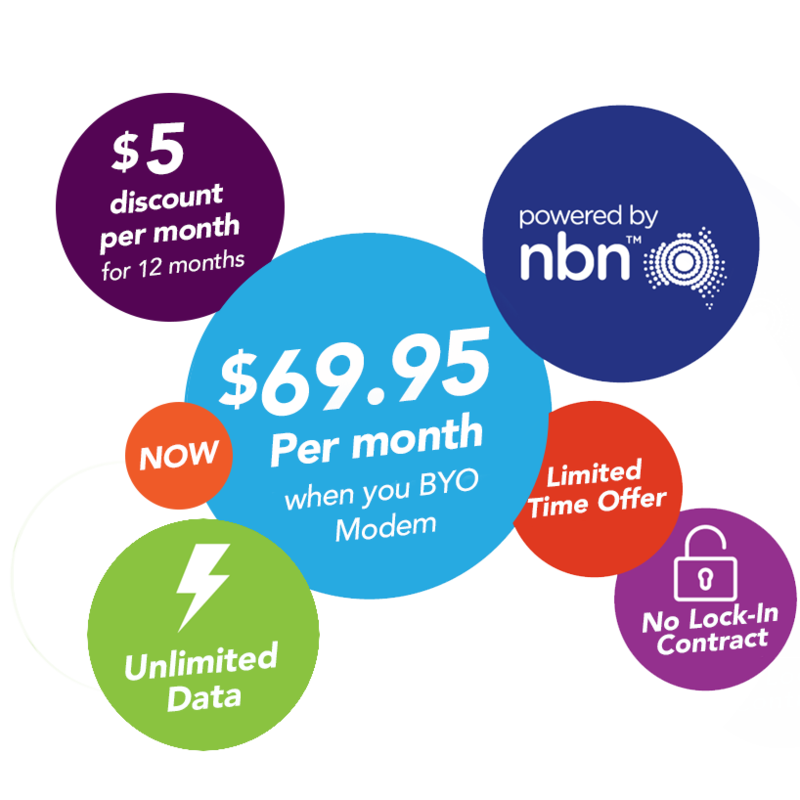 The Unlimited Essential Promo plan provides you unlimited data with typical evening speeds of 43Mbps, unlimited calls to Aussie landlines for $69.95 per month when you bring your own modem (BYO). Available to new MyRepublic customers in selected areas. Speeds may vary. *$69.95 is inclusive of a $5 promotional monthly discount; this discount shall be valid for the first 12 months only. We reserve the right to cancel the promotion(s) without prior notice. All our broadband plans include unlimited calls to Aussie landlines, and low pay as you go rates around the world. 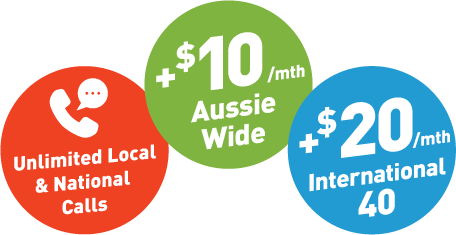 Upgrade to the Aussie Wide plan for $10 per month for included mobile calls within Australia. Or take the International 40 plan for $20 per month for unlimited International calls to selected countries. 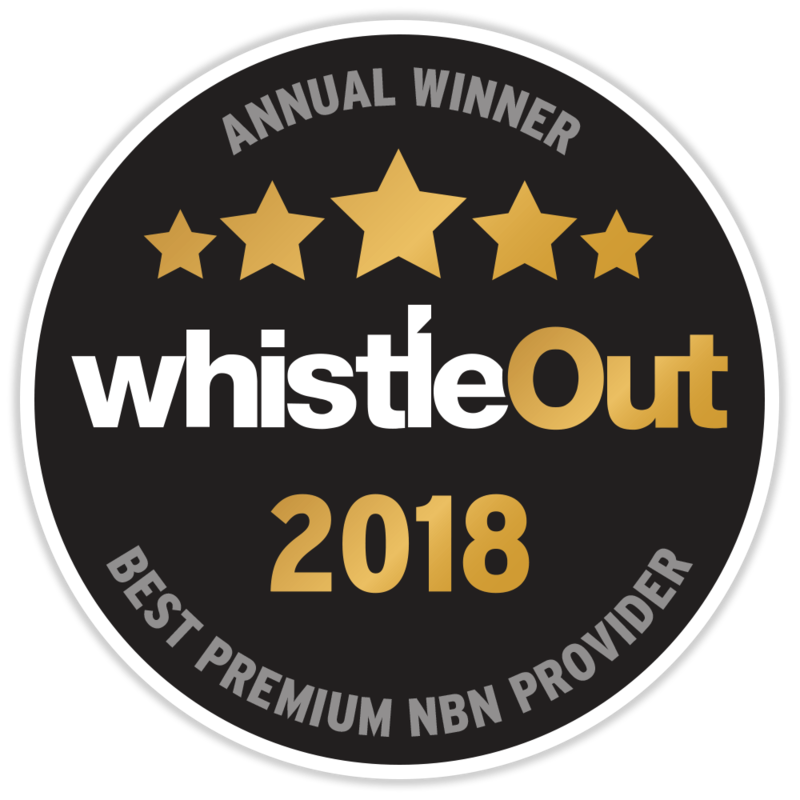 MyRepublic is excited to be named the Best Premium nbn™ Provider by WhistleOut in 2018. ‘MyRepublic has built a strong brand based on delivering high-speed internet and is WhistleOut’s 2018 winner for Best NBN Provider in the Premium category. These plans offer lightning fast NBN at a great price and are a fine choice for anyone with a need for speed. You can now power your small business through MyRepublic Business Solutions. 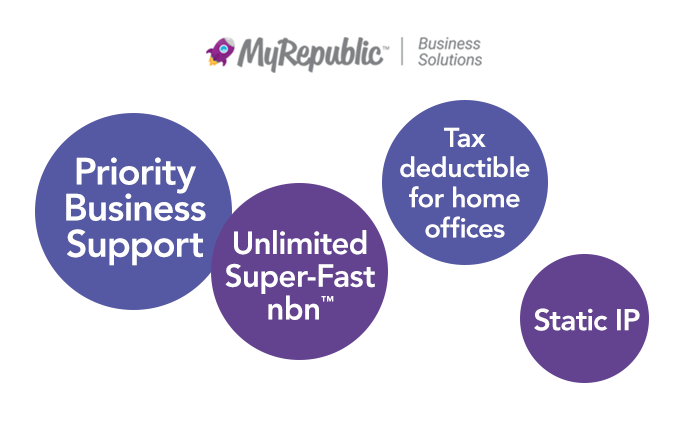 Our simplified business plans come with unlimited super-fast nbn™, one business phone line, unlimited calls to Aussie landlines, Static IP and dedicated business support. So you can focus more on your business. We know our customers like to contact us in different ways, so we have different channels for you to get in touch. Billing & Payments: You can pay an outstanding bill, or go to MyAccount to update your payment information. Submit an online form: Don’t have time to chat? Submit an Online Request Form for the most common requests such as moving home, changing plans, raising a support case and much more. We’ll always do our best to get back to you within 24 hours. Like to chat? Chat to our team online. Click on our Support Page to get started. Feeling social? You can contact us via Facebook and Twitter. Call Us: Our contact number can be found here. Information on our hours of service can be found here. MyRepublic was built specifically to maximise the user experience on National Broadband Networks using our flexible traffic priority system. Simply plug your compatible telephone into your MyRepublic modem. All our plans provide unlimited calling to Aussie landlines or choose from one of our unlimited home phone plans. You don’t need to worry about silly data caps with MyRepublic since all our plans come with super-fast, unlimited data, at one low price. 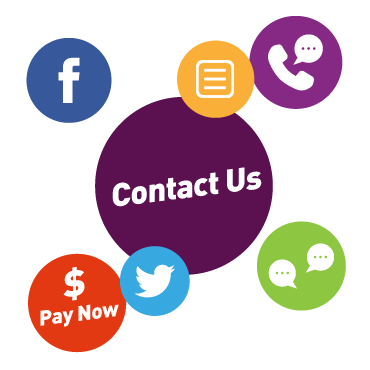 We have many ways for you to get in touch with us. Visit our Contact Us page for our contract details and opening hours. Upgrade to Gamer Pro to enjoy a network geared towards gaming, unlimited downloads, Static IP and Gamer Perks. Our no lock-in contract gives you flexibility and the option to BYO modem. With customers in Singapore, Indonesia, New Zealand and Australia, you can be confident that you are joining the market leader in Next Generation Networks. nbn™, nbn co, Powered by nbn™, Retail Service Provider of nbn™ and other nbn™ Brands are trademarks of nbn co limited and used under licence.